Second Joint debate, August 27, 1858 at Freeport, Illinois. 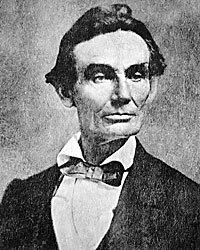 Lincoln, as reported in the Press & Tribune. Douglas, as reported in the Chicago Times. I have supposed myself since the organization of the Republican party at Bloomington, in May, 1856, bound as a part man by the platforms of the party, then and since. If in any interrogatories which I shall answer I go beyond the scope of what is within these platforms it will be perceived that no one is responsible but myself. A. I do not stand pledged to the prohibition of the slave trade between the different States. As to the first one, in regard to the Fugitive Slave Law, I have never hesitated to say, and I do not now hesitate to say, that I think, under the Constitution of the United States, the people of the Southern States are entitled to a congressional Fugitive Slave Law. Having said that, I have had nothing to say in regard to the existing Fugitive Slave Law further than that I think it should have been framed so as to be free from some of the objections that pertain to it, without lessening its efficiency. And inasmuch as we are not now in an agitation in regard to an alteration or modification of that law, I would not be the man to introduce it as a new subject of agitation upon the general questions of slavery. In regard to the fifth interrogatory, I must say here, that as to the question of the abolition of the Slave Trade between the different States, I can truly answer, as I have, that I am pledged to nothing about it. It is a subject to which I have not given that mature consideration that would make me feel authorized to state a position so as to hold myself entirely bound by it. In other words, that question has ever been prominently enough before me to induce me to investigate whether we really have the Constitutional power to do it. I could investigate it if I had sufficient time, to bring myself to a conclusion upon that subject, but I have not done so, and I say so frankly to you here, and to Judge Douglas. I must say, however, that if I should be of opinion that Congress does possess the Constitutional power to abolish the slave trade among the different States, I should still not be in favor of the exercise of that power unless upon some conservative principle as I conceive it, asking to what I have said in relation to the abolition of slavery in the District of Columbia. My answer as to whether I desire that slavery should be prohibited in all the Territories of the United States if full and explicit within itself, and cannot be made clearer by any comments of mine. So I suppose in regard to the question whether I am opposed to the acquisition of any more territory unless slavery is first prohibited therein, my answer is such that I could add nothing by way of illustration, or making myself better understood, than the answer which I have placed in writing. Now in all this, the Judge has me and he has me on the record. I suppose he had flattered himself that I was really entertaining one set of opinions for one place and another set for another place – that I was afraid to say at one place what I uttered at another. What I am saying here I suppose I say to a vast audience as strongly tending to Abolitionism as any audience in the State of Illinois, and I believe I am saying that which, if it would be offensive to any persons and render them enemies to myself, would be offensive to persons in this audience. I have been in the habit of charging as a matter of belief on my part, that, in the introduction of the Nebraska bill into Congress, there was a conspiracy to make slavery perpetual and national. I have arranged from time to time the evidence, which establishes and proves the truth of this charge. I recurred to this charge at Ottawa. I shall not now have time to dwell upon it at very great length, but inasmuch as Judge Douglas in his reply of half an hour, made some points upon me in relation to it, I propose a noticing a few of them. But to draw your attention to one of the points I made in this case, beginning at the beginning. When the Nebraska bill was introduced, or a short time afterwards by an amendment I believe, it was provided that it must be considered ‘the true intent and meaning of this act not to legislate slavery into any State or Territory, or to exclude it therefrom, but to leave the people thereof perfectly free to form and regulate their own domestic institutions in their own way, subject only to the Constitution of the United States.’ I have called his attention to the fact that when he and some others began arguing that they were giving an increased degree of liberty to the people in the Territories over and above what they formerly had on the question of slavery, a question was raised whether the law was enacted to give such unconditional liberty to the people, and to test the sincerity of this mode of argument, Mr. [Salmon P.] Chase, of Ohio, introduced an amendment, in which he made the law – if the amendment were adopted – expressly declare that the people of the Territory should have the power to exclude slavery if they saw fit. I have asked attention also to the fact that Judge Douglas and those who acted with him, voted that amendment down, notwithstanding it expressed exactly the thing they said was the true intent and meaning of the law. I have called attention to the fact that in subsequent times, a decision of the Supreme Court has been made in which it has been declared that a Territorial Legislature has no constitutional right to exclude slavery. And I have argued and said that for men who did intend that the people of the territory should have the right to exclude slavery absolutely and unconditionally, the voting down of Chase’s amendment is wholly inexplicable. It is a puzzle – a riddle. But I have said that with men who did look forward to such a decision, or who had it in contemplation, that such a decision of the Supreme Court would or might be made, the voting down of that amendment would be perfectly rational and intelligible. It would keep Congress from coming in collision with the decision when it was made. Anybody can conceive that if there was an intention or expectation that such a decision was to follow, it would not be a very desirable party attitude to get into for the Supreme Court – all or nearly all its members belonging to the same party – to decide one way, when the party in Congress had decided the other way. Hence it would be very rational for men expecting such a decision, to keep the niche in that law clear for it. After pointing this out, I tell Judge Douglas that it looks to me as though here was the reason why Chase’s amendment was voted down. I tell him that as he did, and knows why he did it, if it was done for a reason different from this, he knows what that reason was, and can tell us what it was. I tell him, also, it will be vastly more satisfactory to the country, for him to give some other plausible, intelligible reason why it was voted down than to stand upon his dignity and call people liars. [Loud cheers.] Well, on Saturday he did make his answer, and what do you think it was? He says if I had only taken upon myself to tell the whole truth about that amendment of Chase’s no explanation would have been necessary on his part – or words to that effect. Now, I say here, that I am quite unconscious of having suppressed anything material to the case, and I am very frank to admit if there is any sound reason other than that which appeared to me material, it is quite fair for him to present it. What reason does he propose? That when Chase came forward with his amendment expressly authorizing the people to exclude slavery from the limits of every Territory, Gen. [Lewis] Cass proposed to Chase, if he (Chase) would add to his amendment that the people should have the power to introduce or exclude, they would let it go. (This is substantially his reply.) And because Chase would not do that, they voted his amendment down. Well, it turns out, I believe, upon examination, that General Cass took some part in the little running debate upon that amendment, and then ran away and did not vote on it at all. [Laughter.] Is not that the fact? So confident, as I think, was Gen. Cass, that there was a snake somewhere about, he chose to run away from the whole thing. This is an inference I draw from the fact that though he took part in the debate, his name does not appear in the ayes and noes. But does Judge Douglas’ reply amount to a satisfactory answer? [Cries of ‘yes,’ ‘yes,’ ‘ and ‘no,’ ‘no.’] This is some little difference of opinion here. [Laughter.] But I ask attention to a few more views bearing on the question of whether it amounts to a satisfactory answer. The men, who were determined that that amendment should not get into the bill and spoil the place where the Dred Scott decision was to come in, sought an excuse to get rid of it somewhere. One of these ways – one of these excuses – was to ask Chase to add to his proposed amendment a provision that the people might introduce slavery if they wanted to. They very well knew Chase would do no such thing – that Mr. Chase was one of the men differing from them on the broad principle of his insisting that freedom was better than slavery – a man who would not consent to enact a law, penned wit his own hand, by which he was made to recognize slavery on the one hand and liberty on the other as precisely equal; and when the insisted on his doing this, they very well knew they insisted on that which he would not for a moment thing of doing; and that they were only bluffing him. I believe (I have not, since he made his answer, had a chance to examine the journals or Congressional Globe, and therefore speak from memory) – I believe the state of the bill at that time, according to parliamentary rules, was such that no member could propose an additional amendment to Chase’s amendment. I rather think this is the truth – the Judge shakes his head. Very well. I would like to know, then, if they wanted Chase’s amendment fixed over, why somebody else could have offered to do it? If they wanted it amended, why did they not offer the amendment? Why did they not put it in themselves? But to put it on the other ground, suppose there was such an amendment offered, and Chase’s was an amendment to an amendment; until one is disposed of by parliamentary law, you cannot pile another on. Then all these gentlemen had to do was to vote Chase’s on, and then in the amended form in which the whole stood, add their own amendment to if they wanted it put in that shape. This was all they were obliged to do, and the ayes and noes show that there were 36 who voted it down, against 10 who voted in favor of it. The 36 held entire sway and control. They could in some form or other have put that bill in the exact shape they wanted. If there was a rule preventing their amending it at the time, they could pass that, and then Chase’s amendment being merged, put it in the shape they wanted. They did not choose to do so, but they went into a quibble with Chase to get him to add what they knew he would not add, and because he would not, they stand upon that flimsy pretext for voting down what they argued was the meaning and intent of their own bill. They left room thereby for this Dred Scott decision, which goes very far to make slavery national throughout the United States. I pass one or two points I have because my time will very soon expire, but I must be allowed to say that Judge Douglas recurs again, as he did upon one or two other occasions, [to] the enormity of Lincoln – an insignificant individual like Lincoln – upon his ipse dixit charging a conspiracy upon a large number of members of Congress, the Supreme Court and two Presidents, to nationalize slavery. I want to say that, in the first place, I have made no charge of this sort upon my ipse dixit. I have only arranged the evidence tending to prove it, and presented it to the understanding of others, saying what I think it proves, but giving you the means of judging whether it proves it or not. This is precisely what I have done. I have no placed it upon my ipse dixit at all. On this occasion, I wish to recall his attention to a piece of evidence which I brought forward at Ottawa on Saturday, showing that he had made substantially thesame charge against substantially the same persons, excluding his dear self from the category. I ask him to give some attention to the evidence which I brought forward, that he himself had discovered a ‘fatal blow being struck’ against the right of the people to exclude slavery from their limits, which fatal blow he assumed as in evidence in an article in the Washington Union, published ‘by authority.’ I ask by whose authority? He discovers a similar or identical provision in the Lecompton Constitution. Made by whom? The framers of that Constitution. Advocated by whom? By all the members of the party in the nation, who advocated the introduction of Kansas into the Union under the Lecompton Constitution. My friends, it will readily occur to you that I cannot in half an hour notice all the things that so able a man as Judge Douglas can say in an hour and a half, and I hope, therefore, if there be anything that he has said upon which you would like to hear something from me, but which I omit to comment upon, you will bear in mind that it would be expecting an impossibility for me to go over his whole ground. I can but take up some of the points that he has dwelt upon, and employ my half-hour specially on them. The Judge complains that I did not fully answer his questions. If I have the sense to comprehend and answer those questions, I have done so fairly. If it can be pointed out to me how I can more fully and fairly answer him, I aver I have not the sense to see how it is to be done. He says I do not declare I would in any event vote for the admission of a slave State to the Union. If I have been fairly reported he will see that I do give an explicit answer to his interrogatories. I did not merely say that I would dislike to be put to the test; but I said clearly; if I were put to the test, and a Territory from which slavery had been excluded should present herself with a State Constitution sanctioning slavery – a most extraordinary thing and whole unlikely ever to happen – I did not see how I could avoid voting for her admission. But he refuses to understand that I did not say so. Yet it will be so reported in the printed speech that he cannot help seeing it. He says if I should vote for the admission of a Slave State I would be voting for a dissolution of the Union, because I hold that the Union can not permanently exist half slave and half free. I repeat that I do not believe this Government can endure permanently half slave and half free, yet I do not admit, nor does it at all follow, that the admission of a single Slave State will permanently fix the character and establish this as a universal slave nation. The Judge is very happy indeed at working up these quibbles. [Laughter and cheers.] Before leaving the subject of answering questions I aver as my confident belief, when you come to see our speeches in print, that you will find every question which he has answered those which I put to him. Is not that so? [Cries of yes, yes.] The two speeches may be placed side by side; and I will venture to leave it to impartial judges whether his questions have not been more directly and circumstantially answered than mine. 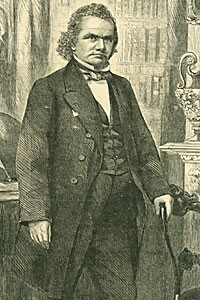 Judge Douglas says he made a charge upon the editor of the Washington Union, alone, of entertaining a purpose to rob the States of their power to exclude slavery from their limits. I undertake to say, and I make the direct issue, that he did not make his charge against the editor of the Union alone. [Applause.] I will undertake to prove by the record here, that he made that charge against more and higher dignitaries than the editor of the Washington Union. I am quite aware that he was shirking and dodging around the form in which he put it, but I can make it manifest that he leveled his ‘fatal blow’ against more persons than this Washington editor. Will he dodge it now by alleging that I am trying to defend Mr. Buchanan against the charge? Not at all. Am I not making the same charge myself? [Laughter and applause.] I am trying to show that you, Judge Douglas, are a witness on my side. [Renewed Laughter.] I am not defending Buchanan, and I will tell Judge Douglas that in my opinion, when he made that charge, he had an eye farther North than he was to-day. He was then fighting against people who called him a Black Republican and an Abolitionist. It is mixed all through his speech, and it is tolerably manifest that his eye was a great deal farther North than it is to-day. [Cheers and laughter.] The Judge says that though he made this charge [Robert] Toombs got up and declared there was not a man in the United States, except the editor of the Union, who was in favor of the doctrines put forth in that article. And thereupon, I understand that the Judge withdrew the charge. Although he had taken extracts from the newspaper, and then from the Lecompton Constitution, to show the existence of a conspiracy to bring about a ‘fatal blow,’ by which the States were to be deprived of the right of excluding slavery, it all went to pot as soon as Toombs got up and told him it was not true. [Laughter.] It reminds me of the story that John Phoenix, the California railroad surveyor, tells. He says they started out from the Plaza to the Mission of Dolores. They had two ways of determining distances. One was by a chain and pins taken over the ground. The other was by a ‘go-it-ometer’ – an invention of his own – a three-legged instrument, with which he computed a series of triangles between the points. At night he turned to the chain-man to ascertain what distance they had come, and found that by some mistake he had merely dragged the chain over the ground without keeping any record. By the ‘go-it-ometer’ he found he had made ten miles. Being skeptical about this, he asked a drayman who was passing how far it was to the plaza. The drayman replied it was just half a mile, and the surveyor put it down in his book – just as Judge Douglas says, after he had made his calculation and computations, he took Toombs’ statement. [Great laughter.] I have no doubt that after Judge Douglas had made his charge, he was as easily satisfied about its truth as the survey was of the drayman’s statement of the distance to the plaza. [Renewed laughter.] Yet it is a fact that the man who put forth all that matter which Douglas deemed a ‘fatal blow’ at State sovereignty, was elected by the Democrats as public printer. Mr. President you here find several distinct propositions advanced boldly by the Washington Union editorially and apparently authoritatively, and every man who questions any of them is denounced as an abolitionist, a Free-Soiler, a fanatic. The propositions are, first, that the primary object of all government at its original institution is the protection of persons and property; second, that the Constitution of the United States declares that the citizens of each State shall be entitled to all the privileges and immunities of citizens in the several States; and that, therefore, thirdly, all State laws, whether organic or otherwise, which prohibit the citizens of one State from settling in another with their slave property, and especially declaring it forfeited, are direct violations of the original intention of the Government and Constitution of the United States; and fourth, that the emancipation of the slaves of the Northern States was a gross outrage on the rights of property, inasmuch as it was involuntarily done on the part of the owner. And a column, nearly of the same sort. Then, when you come to look into the Lecompton Constitution, you find the same doctrine incorporated in it, which was put forth editorially in the Union. What is it? It will be seen by these clauses in the Lecompton Constitution that they are identical in spirit with this authoritative article in the WashingtonUnion of the day previous to its endorsement of this Constitution. When I saw that article in the Union of the 17th of November, followed by the glorification of the Lecompton Constitution on the 18th of November, and this clause in the Constitution asserting the doctrine that a State has no right to prohibit slavery within its limits, I saw there was a fatal blow being struck at the sovereignty of the States of this Union. When I saw that articles in the Union of the 17th of November, followed by the glorification of the Lecompton Constitution on the 18th of November, and this clause in the Constitution asserting the doctrine a State has no right to prohibit slavery within its limits, I saw that there was a fatal blow being struck at the sovereignty of the States of this Union. Stephen B. Oates, With Malice Toward None: A Life of Abraham Lincoln, p. 155-156. Henry Villard, “Recollections of Lincoln”, Atlantic Monthly, February 1904, p. 165-174. John G. Nicolay, A Short Life of Abraham Lincoln, p. 121-122. Emanuel Hertz, The Hidden Lincoln from the Letters and Papers of William H. Herndon, p. 255-256 (Letter from William H. Herndon to Jesse W. Weik, October 2, 1890). Ida M. Tarbell, The Life of Abraham Lincoln, Volume II, p. 316. Benjamin Thomas, Abraham Lincoln, p. 189. William E. Barton, The Life of Abraham Lincoln, p. 392. Don E. Fehrenbacher, Prelude to Greatness: Lincoln in the 1850’s, p. 136-137. Harry V. Jaffa, Crisis in the House Divided, p. 355. Damon Wells, Stephen Douglas: The Last Years, 1857-1861, p. 115. Herbert Mitgang, editor, Lincoln as They Saw Him, p. 114-115 (Illinois State Journal, October 6, 1854). Roy P. Basler, editor, The Collected Works of Abraham Lincoln, Volume III, p. 38-49. Roy P. Basler, editor, The Collected Works of Abraham Lincoln, Volume II, p. 70-76.